In the process of its development, TaiChi gradually evolved into many different styles. The four major styles are Yang, Chen, Sun, Wu. The Chen style has the longest history, and the Yang has the reputation of popularity. The characteristics of Chen are: powerful, twisting, fast and slow, up and down, more masculine than feminine…. 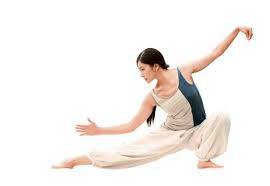 The characteristics of Yang are: extended and natural postures, slow and even motions, light and steady movements. It’s as smooth as floating clouds and flowing streams…. The characteristics of Sun are: light and agile, steps smaller and easier, one foot moves, the other one follows, two hands open and close…. The characteristics of Wu are: more like Yang, but different posture, more turning, more wrist movements…. The traditional routines are not only too long but also every school has its routines and its particular way to do it. These reasons made Taichi rather difficult to develop. The Chinese State Commission for Physical Culture has been working on it in the past decades. The wider Wushu spreads to the world, the more demands for reforming routines. The Chinese Wushu Association organized the reformation and laid out the competition routines in 1980’s.